The Microsoft Surface Pro 3 is now shipping in more and less powerful variants in the United States and Canada. As expected, the firm has made available the Intel i3 and Intel i7 versions of the high-end post-PC device, to sit alongside the iteration featuring the Intel i5 chipset. The additions to the line up, which are shipping only in North America right now, lowers the entry level for the Surface Pro 3. The i3 version can be snapped up $799 (around £475, AU$857) compared with the $999 (around £593, AU$1072) i5 version, which until now had been the lowest priced option. Likewise the newly available Surface Pro 3 i7 pushes the potential spending up to $1,949 for the top end device with 512GB storage (around £1,157, AU$2,092). 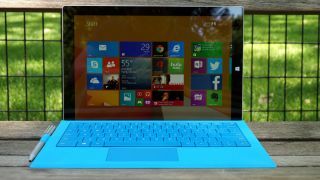 For their expenditure, buyers get Windows 8.1, a 12-inch display and a flexbile, slim and lightweight tablet/laptop hybrid device. There's no word on when either alternate version will be available outside of North America. Will the new entry model level encourage you to hit the Surface like a Pro? Let us know your thoughts below.